Are you an AMSOIL Business Builder? Listening to a recent facebook live with a prominent network marketing trainer. The question came up was “How do you recruit more business builders into your business”. What is a business builder? A business builder is someone who is actively and regularly adding customers and accounts to their AMSOIL Business. The AMSOIL Business is structured in such a way that personal customers are not only encouraged, but highly rewarded. As far as I know, no other home business opportunity allows their distributors to set up other commercial businesses and retailers as factory direct accounts. This hybrid program is what initially attracted us to AMSOIL. Only after understanding the compensation plan and learning about the power of leveraging ones time through recruiting others did we branch out to sponsoring. As far as we’re concerned an AMSOIL Dealer should never stop obtaining their own customers and accounts. These activities are what you should do, as well as show your downline that you are doing what you expect them to do. The AMSOIL Business Opportunity offers a wide variety of options for anyone who desires to become successful building their own business. Over the last 45+ years, AMSOIL dealers have been passionate about helping others understand the quality, performance, and value over time that AMSOIL products provide. Sponsoring dealers – Who Should I Sponsor? In the booklet (no longer available) How to sponsor AMSOIL Dealers there is a list of 10 types of people that make great AMSOIL Dealers. This is a valuable list to help you determine who you should talk to about the AMSOIL Business Opportunity. Caution, this list is by no means a guarantee of finding business builders. This list is also not the only type of people that you could sponsor. Although virtually anyone can be an AMSOIL Dealer and no single quality is a guarantee of success or failure, some characteristics provide good indications of future performance. People who value AMSOIL products. Obviously, people who are enthused about AMSOIL products are more likely to be receptive to the AMSOIL opportunity. A list of satisfied customers is a great place to start looking for you next AMSOIL Dealer. People who have the desire to start their own business. People interested in running a business are more likely to take their AMSOIL business seriously. Many people have a desire to own their own business. Some people like the income opportunity, the freedom of being their own boss, tax advantages, security for retirement and many other reasons. An AMSOIL Dealership is an excellent option because the income opportunity is as great as any other business, but with very minimal start-up costs. Be on the lookout for people who exhibit the self-motivation qualities of an entrepreneur. Look for the same qualities in a personal group Dealer as a salesman for the organization. You want someone who’s serious, capable and responsible. Those who have worked in the direct sales industry have an advantage in the AMSOIL opportunity. They know what direct sales is all about and they can see for themselves through comparison why the AMSOIL opportunity is head-and-shoulders above the rest.Experience in the lubrication or automotive fields is not necessary. However, it can be valuable knowledge because experts in these areas will understand features and benefits of the products, and having existing contacts and experience translates to credibility that helps sell products.Of course, previous sales experience, experience running a business or other kinds of experience can be valuable, too. What’s really important is finding a way to translate whatever experience a new Dealer has into in the AMSOIL business. People looking for retirement income. Retired or soon-to-be-retired people are excellent candidates for a number of reasons. First, they have established a solid work ethic. They know their own strengths and have a realistic idea of what it will take to succeed. Second, they have a huge potential market, since many of their peers are potential AMSOIL customers and even Dealers. Finally, their incentive for building an AMSOIL Dealership is real: They already know the value of their retirement income. People with desire – looking for more out of life. There are a lot of people in the world who aren’t satisfied with their careers or lifestyles. Many of these people will become successful AMSOIL Dealers.The key to deciding which of them will make good Dealers is determining why they aren’t satisfied. It is desire of lack of it? Some people are sick of work simply because they’re sick of working; these people won’t make good AMSOIL Dealers because running an AMSOIL Dealership takes work. Others are sick of work because they aren’t getting the rewards, recognition and respect they believe they’re due. They want more out of life. These are people you should focus on for your personal group. People who are already successful obviously know what it takes to succeed. That kind of knowledge is invaluable in a personal group Dealer. People who can relate to people have unlimited potential as AMSOIL Dealers. Busy people know how to get things done and have the initiative to do something. The return on their investment of time is usually very lucrative to them. Often, married couples make strong AMSOIL Dealerships. A husband/wife team can be like getting two hard-working, knowledgeable Dealers for the price of one. Together, they form an unstoppable AMSOIL force. Be sure to keep your ears open to clues on someone that may fit into one of the above types of people. Engage people in conversation, learn about them–Connect on social media and build your relationship. Don’t forget to ask! Ask someone if they are “open” to taking a look at the AMSOIL Business opportunity. Follow up with people who express interest. Include potential Dealers in your team training. Ask your sponsor and upline Direct Jobber for help, direction and encouragement. Don’t be afraid! That perfect Dealer might just be waiting for you to engage and ask them. In order to be a top level AMSOIL Business builder, you must be working all aspects of the business. Finding Customers, asking for sales, following up and sponsoring new Dealers are all keys in your success now and in the future. 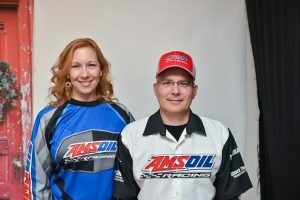 If you are looking to become an AMSOIL Dealer, consider working with us, Michael & Alecia Sparks. We are full-time AMSOIL Direct Jobbers and have many people, just like you get started and have immediate success in building an AMSOIL Business. Don’t hesitate to reach out to us. If you are ready to JOIN AMSOIL please go to our AMSOIL Business Opportunity page to learn more and sign up. We’re looking forward to seeing your successes! AMSOIL was founded with one goal: make the best oil possible! Here is a great article from our monthly AMSOIL Dealer magazine dated October 2017. Enjoy! This company was founded with one goal: make the best oil possible (mission accomplished!). But that goal actually supported a broader ideal, which was to support “the little guy.” Our founder, Al Amatuzio, believed that no one was looking out for the little guy when it came to automotive lubrication. If this technology exists, he thought, why isn’t it being made available to the public? So, he set to work changing that. Later, the Dealer network was founded, once again providing options for the little guy. Since then, thousands of AMSOIL Dealers have joined the network, and each one has had his/ her own reasons for signing up. Some are looking for something to do in retirement, others are looking for extra money to retire sooner. Some are looking for a way to boost their kids’ college funds or make the payments on a new boat. Some Dealers just like being part of the team and interacting with like-minded people. Whatever their motivations may be, a whole lot of little guys are finding fulfillment with an AMSOIL Dealership today. The best part is, most of them are having a lot of fun, too. Who would have thought you could work your way toward financial independence and have fun doing it? There is no opportunity like the AMSOIL opportunity. World-class products, national advertising and sponsorships, free online training, fast shipping, no inventory requirements, low startup costs – you won’t find this same list of benefits with other entrepreneurial opportunities. Here’s something else you can count on from AMSOIL: continual improvement. And that applies to all aspects of the company. Behind the scenes, we’ve recently been working on our customer service so we can serve you and our mutual customers better. Publicly, we’ve recently launched improved versions of two of our top product lines, Signature Series and XL Synthetic Motor Oil. There’s more to come. There are exciting product innovations on the horizon and more program enhancements that we know you will love. Whatever your motivations for being an AMSOIL Dealer, we hope you’ll make the most of these benefits. Recruit more Dealers, customers and accounts. Make that boat payment or pad your retirement account. Whatever you do, have fun doing it. The best time to become an AMSOIL dealer was 10, 20, or 30 years ago, but the second best time is today and we would even argue, because of the changes and advances in technology it’s much easier today to become successful right away than it was even when we started as dealers back in 2000. Yeah we have a head start, but every AMSOIL dealer has the same opportunity for success if they apply themselves. We have even argued that the #1 dealer in the company has not even been sponsored yet. This business will continue to provide an outstanding business opportunity for anyone who puts for the effort. Our promise to you as your upline sponsoring dealer is that we will support you 100%, we will share with you and your team what we have done to become successful and we will praise your successes from the rooftop! This weeks blog post is going to be a good one for those dealers that are interested in an effective way to grow their business. Recruiting new dealers, customers and accounts to help you grow is one of the most important activities a dealer can do. Sponsoring new dealers into your business creates leverage for your sales efforts and can exponentially grow your business. Each month AMSOIL Inc, puts out a publication called AMSOIL Magazine. There are great articles and tips on sales, products, and company information as well as dealer recognition. Below is an article written by Bryce Malone, VP, Dealer sales and service. I think you will find this article interesting and easy to implement into your AMSOIL Business. Successful recruitment is guaranteed to grow your business. AMSOIL Dealers often ask us what suggestions we have to grow their business. There are a number of answers we can provide depending on each Dealer’s circumstances, but there is truly only one answer that applies to all: RECRUIT. If every dealer in our network recruited one new buying customer every month, everyone within the network would experience significant growth. they key here is recriiting BUYING customers. Registering an account or preferred customer (PC) is the goal. Getting an account or customer to buy AMSOIL products is the goal. Sure, accounts and PC’s need to be registered in order to purchase, but they only have value when they buy. Currently only about 25% of Dealers actually register a customer or account annually, and only about half of those customers and accounts make a purchase. Not great numbers. Recruiting double or even triples your efforts. That doesn’t mean you register everyone as as an AMSOIL Dealer, but if you register one customer month, and each of those customers tells a friend, who tells a coworker or family member – you get the picture. The key is expanding to new markets that you have not yet tapped into, and there are many of them. For example, how many people in their 20’s and 30’s do you know? Your grandchildren, nephews, nieces, sons and daughters drive cards, have friends and could certainly use some extra cash. Every Dealer knows of people who they could speak to and share the AMSOIL story with. Shoot them an email, put something on social media, send a text or write a letter. There are a number of ways you can tell the story and what AMSOIL means to you. Make it a point to talk about AMSOIL to as many people as you can as often as you can. I am going to issue a challenge to every AMSOIL Direct Jobber. Get your sales teams activated! Lead by example, register new buying customers and accounts, and teach your Dealers to do the same. Issue your own challenge to them. You won’t succeed by registering new dealers and just assuming they are doing the work you should also be doing. If everyone thinks someone else is doing the work, none of the work gets done. This is a very attainable goal. Register one new buying Dealer, customer or account per month and see what happens. Your group will grow exponentially, and your income will grow right along with it. There is no downside to setting and attaining these goals. At the DJ Convention, I will award the DJ whose sales team registers the most buying dealers, customers and accounts between July 1 and Sept. 31 with the newly created “Elite Dealer Award” along with a little something extra. In addition the dealer in that DJ’s network who registers the new buying Dealers, customers and accounts will be recognized and awarded some extra cash in his or her pocket. I”m not going to tell you how much; it’s a surprise. Get after it, get your sales teams after and see you in Tampa. As a dealer it has been my goal to have at least 10 newly registered customers each and every month. We’re serious full-time dealers and earn a great living with AMSOIL. New dealers starting out need to determine their level of commitment. The AMSOIL Business Opportunity runs the gamut from strictly part-time dealers to full time dealers that earn a significant 6 figure income. To help you set your own sales goals, we recommend all dealers work with their sponsoring dealer, their upline Direct Jobbers as well as the Corporate Dealer sales team. It’s in their best interest to help you succeed. If you have been thinking about becoming an AMSOIL Dealer we would love to work with you. Check out the AMSOIL Business opportunity page and get registered. The best time to become an AMSOIL dealer was 20 years ago, the next best time is TODAY! The AMSOIL Business Opportunity is strong for those that have a desire to succeed. Since the early 2000 the AMSOIL preferred customer program has been a huge success for both AMSOIL Inc and AMSOIL Independent dealers. The AMSOIL preferred customer program works like a membership store (e.g. Costco or Sam’s Club), a preferred customer pays a yearly fee which then entitles them to a discount on AMSOIL products. The current fee as of this post is $10 for 6 month trial or $20 per year. Currently a preferred customer can receive a discounted rate when using the auto-renew feature. 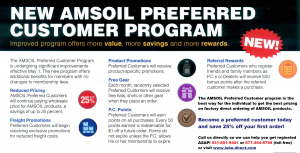 The exciting news for AMSOIL preferred customers is the new “AMSOIL Perks” that have been implemented. Preferred Customers will receive exclusive promotions for reduced freight costs, this will be promoted to the preferred customers via email, so be sure you have a valid email on file with AMSOIL Inc.
As part of the AMSOIL Branding Experience, each month, randomly selected preferred customers will receive free hats, shirts or other gear when they place an order. AMSOIL Preferred Customers will earn points on all purchases. Every 50 points earned is redeemable for $1 off a future order. Points do not expire unless the preferred customer allows their membership to expire. A great way to prevent this is to do the auto-renew feature available in each customers online account. Preferred customers who register friends and family members as preferred customers or dealers will receive 500 bonus points after the P.C. make an initial purchase. Currently registered preferred customers also have the option of upgrading to become an Independent AMSOIL Dealer in the future. Many successful AMSOIL Dealers started out as customers. It’s easy to upgrade to become an AMSOIL Dealer, just log into your AMSOIL Account and click on the “Buy Wholesale” like at the top of their website. This will give you the option to upgrade. Likewise there are currently many AMSOIL Dealers that may have started out with great intentions but have decided the dealership option is not for them. Current and past AMSOIL Dealers can downgrade to the preferred customer status and begin receiving P.C. Perks. Currently many AMSOIL dealers are really just dealers in name only and only purchase the products for their own use. Maybe becoming an AMSOIL preferred customer is a better option. If you are a current AMSOIL Dealer, you can downgrade your account (an save $10 a year) to preferred customer. The easiest way to do this is to called the AMSOIL ordering line 1-800-777-7094 Mon-Fri. 7:00 am-7:00 pm central time. If you are seriously considering the AMSOIL Dealer option, get started with us today by learning more how the AMSOIL Business Opportunity can help you become financially independent and create the lifestyle that want. A recent article in the AMSOIL Dealer Magazine points out how the AMSOIL Business Opportunity for Independent AMSOIL dealers stands out in the sea of thousands of Network Marketing and MLM businesses. Personally over the years we have been prospected by hundreds of other home business owners with their opportunity for financial independence and success. For whatever reason, way back in 1999 when we started exploring the AMSOIL business opportunity, we’ve always felt that we were part of something unique in the home business arena. With those that have approached us to check out their business we have never seen a networking marketing company that compares to the current programs that AMSOIL offers it’s dealers. We know there are thousands of legitimate MLM businesses and many are great opportunities that have been around for a long time. But it’s hard to beat what AMSOIL offers those that take the leap of faith and join. If you are now just exploring the AMSOIL Opportunity for the first time, be sure to take a look at our business opportunity page. Multi-Level Marketing (MLM) companies have offered business ventures to independent business owners for decades. AMSOIL adopted an MLM program in 1973, but has evolved through the years into something entirely different from today’s MLM companies. AMSOIL offers Dealers more opportunities to build successful businesses. Typical MLM companies rely on their distributors being adept at sponsoring and person-to-person sales. While both are also important to the AMSOIL opportunity, we offer Commercial and Retail Programs designed to help Dealers move larger volumes of product and more effectively build their BUSINESSES To our knowledge no other company offers similar programs. Additional exposure comes through the country’s biggest events, including Daytona Bike Week, and the Sturgis Motorcycle Rally. We also sponsor high profile racing series, including Monster Energy Supercross, the TORC Series presented by AMSOIL and more. AMSOIL corporately sponsored professional motorcycle, off-road truck, boat, ATV, snowmobile and drag racers further heighten brand awareness, generating interest in AMSOIL products for Dealers across North America. Some MLM companies place their primary emphasis on recruiting new distributors, while de-emphasizing product sales, something that is not conducive to long-term success. and fuel additives that help Dealers, and their personal groups, build thriving and lasting businesses. The best companies are in it for the long, and they work hard to establish solid reputations. They look to the future, commit to long-term goals and reinvest money toward future growth. products released, advancements at AMSOIL facilities and the growing number of AMSOIL Dealers and customers. Good companies provide quality products that are competitively priced and in-demand by the general public. Not only does quality attract consumers, it inspires confidence and enthusiasm in distributors. AMSOIL products are second to none. They are relied upon by millions to protect their vehicles and equipment, maximize engine performance, reduce maintenance costs and help extend vehicle and equipment life. We remain committed to introducing innovative, dynamic, competitively priced products that will continue to define the industry. Knowledgeable distributors are successful distributors, and good companies put great effort into training. They provide a wide selection of literature and educational tools and provide direct access for their distributors. in the education of Dealers. Dealers are also provided opportunities to learn directly from AMSOIL corporate staff at conventions and regional sales meetings, as well as through phone and email communications. The best companies have dedicated distributors. Good people are attracted to good companies, and they find security in knowing that their commitment pays off. We have a solid reputation with our vast network of loyal independent AMSOIL Dealers, who have experienced the benefits of the products, believe in them and are committed to building a successful business around them. As you see the future of the AMSOIL Business Opportunity is bright. With any business there are challenges, trials and tribulations. Most worthwhile things in life are not easy. Just like any legitimate business the success is what you make of it. Many dealers enjoy great part-time income, while still others earn great full-time plus incomes. Then their are those who shoot for the stars and go on to earn significant incomes that are in the top 1% of all incomes in country. The key in building a successful AMSOIL business is starting. Without starting, success is all but impossible. The other key is learning new skills that can help someone propel themselves to success in the endeavors they choose. You may ask, what is the downside? Many MLM programs only have one way to earn money. These programs are very easily to duplicate and can be trained to anyone very quickly. With AMSOIL and the multiple sales programs combined with a vast product line, it can be intimidating to the newer dealer. It is very important to be aligned with a successful dealer that can help your goals to success. Finding a knowledgeable and successful sponsor is important. This is why we created this AMSOIL Dealer training website. It is our hope to help you get started right, become successful immediately and enjoy building your AMSOIL Business.